At twenty-four Philippa Moore is overweight, unhappily married, and still living in her hometown of Hobart, Tasmania. After a wake-up call in a department-store changing room, Phil suddenly realises that she is on the wrong path. With determination she starts to shed the kilos, and makes a confronting discovery: she is in charge of her own life. Starting over again in Melbourne, she launches an award-winning health and fitness blog, Skinny Latte, and finds the courage to leave her marriage. She then sets out on an international odyssey, travelling the length and breadth of North America and throwing herself into every new experience she encounters. An intuitive friend predicts that true love is in her future but, still scarred from her failed relationship, she can scarcely bring herself to believe it. When she arrives in London, though, she finds the life she has always been looking for, coming to realise that excuses for not doing the things you dream of doing are just that: excuses. 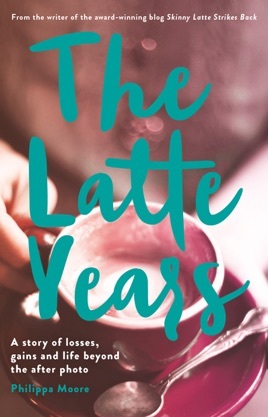 The Latte Years is the brave story of a life restarted, of the battles still to be won once the ‘after’ photo has been taken. Told with humour, insight and a great deal of coffee, it shows that we have the power to change anything, and inspires us to live our best, most authentic life. Philippa Moore is a writer, editor and award-winning blogger who has held a lifelong fascination with language and stories. Her writing has been published widely and she also hosts a popular podcast, Book Ends, featuring interviews with leading contemporary writers. She was the author of the award-winning health and fitness blog, Skinny Latte Strikes Back, which was one of the UK’s most popular health and fitness blogs. Philippa now lives in North London with her husband Tom and many pairs of running shoes. The skinny latte blog was a great read. This book contained a lot of what was in the blog. There were some interesting extra parts, which were very candid. The writing was average. The long rants regarding ex-friends were repetitive, a little childish and full of psycho-babble, and this brought the book down.